Here is some of our review of what customers are saying about us! To see some pictures of the dishes cooked visit our gallery page. To see all the reviews on Facebook please visit our Facebook page here. Fabulous evening with amazing food. Will definitely be back! I went to the comfort food pop up evening, I wasn’t sure what to expect but the evening was just delightful. The food was incredible, melt in your mouth meat and plenty of it. I was sat at a table of 7, the food brought ise together, we all got on really well and got talking until very late. All the food is to share so you can have a little or a much as you want. Don’t forget to bring your own drink and a very empty stomach if you want to make it through the evening. I definitely recommend this slightly quirky set up, it makes a refreshing change from the old pub meal and gives you a chance to meet some new like minded people who will all share a love for food. I attended Steve’s Comfort food pop up restaurant this weekend and was highly impressed. Having experienced his cooking several times before I had immensely high expectations, which were met and then some. The environment was unique, social and welcoming, and the food was delicious! Rather than a normal restaurant Steve provides a whole evening and environment for his guests as well as a continued stream of delicious food. There is no limitations on the quantity of the food and you have the ability to choose as much of the selection of food available as you want. An incredible evening due to the company, the setting, the food and the service. Everybody left happy and full! A must do for anybody who loves exquisite food. Can not recommend enough! I booked Steve a year in advance as I wanted something special for my 40th Birthday (December 2018), about 2 months before I met with Steve and we discussed ideas and Steve prepared a lovely menu of 5 course for my 14 guests. Steve arrived on the party evening and everything was stress free, the food was fabulous, and the evening ran like clock work and my friends haven’t stopped talking about how excellent the food was. Thank you Steve for helping making my party fabulous. Karen and I enjoyed this Asian fusion evening so much, the food was outstanding from the canapes through starters of Miso chicken, pork belly skewers and sesame noodle salad and a main course which included beef cheeks (my favourite) ,chicken katsu and rice. I am not normally a dessert person but the panna cotta with yuzu jelly and black sesame ice cream was amazing. Thanks Steve for a great evening. Many , many thanks to Stephen and Rob for a fantastic Asian fusion evening last Friday. The whole evening was fantastic and the food amazing. 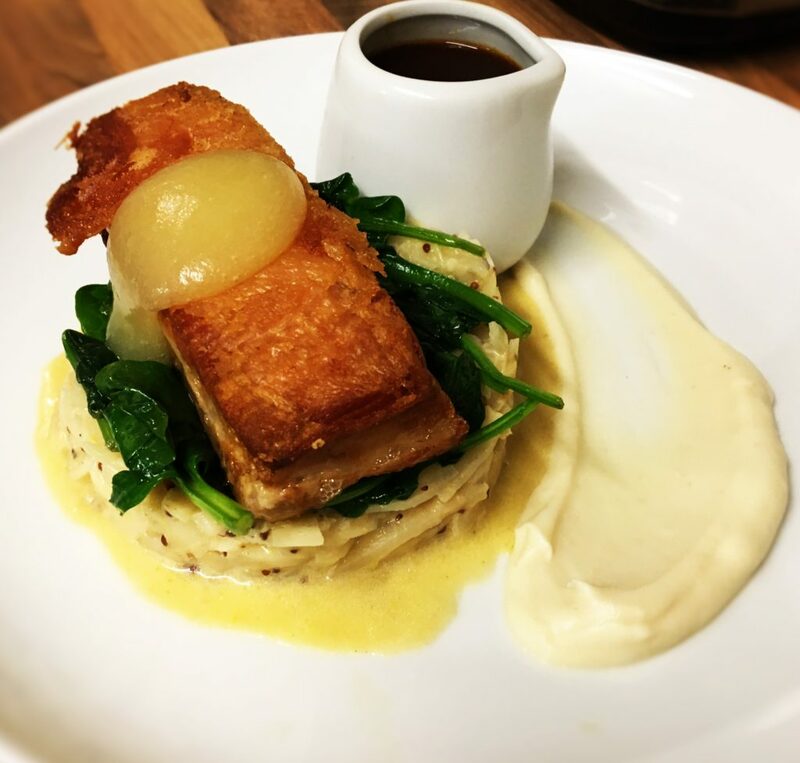 Stephen has a real talent for creating imaginative, flavoursome dishes that test your taste buds. A special mention to the pork and prawn dumplings, and the marinated beef cheeks. If you are looking for that extra something special this is the man to go to. Myself, husband and six friends had the most amazing food prepared and cooked by Steve. James. We requested Fusion style food and Wow were we blown away. Fabulous canapés were served with chilled fizz. Crispy lotus root topped with crispy ginger and quails egg. Melt in the mouth marinated chicken thigh with dipping sauce. My taste buds were buzzing! Then a delicious starter included Thai noodle salad, slow cooked belly pork which just melted in the mouth. Prawn and pork wraps all with delicious dressings, drizzles and dips. Gorgeous main courses of fusion style, slow braised aromatic beef cheek, sticky rice, pickled cucumber and radish salad and Katsu chicken with spicy gravy. Superb choice of puddings too. Vanilla Panna cotta with Yuzu jelly, black sesame ice cream and a matcha tea tulle. Followed by a heavenly tart of crisp, sweet pastry filled with cream, lychees and topped with rose flavoured meringues, raspberries, raspberry sauce and white chocolate. Mmmmmm was the sound around the table all evening. It was a true feast of flavours. Steve cooked for the Love for Somerset team at his B&B in Tintinhull. We were thoroughly spoilt with 5 sumptuous courses and were able to focus on catching up as a team which is so important. Rob served perfectly! Steve has been and catered for my mother and father in law’s golden wedding. We are staying at Upton Grange near Weymouth and he was recommended by the owner of the cottages. He came and cooked an amazing meal just for them and it was wonderful. The entire experience from the initial inquiry via email to the meal tonight has been faultless. I cannot recommend him enough. Thank you again for making the anniversary so special! Steve and his wonderful team catered our wedding in May. Everything was absolutely perfect. The food was incredible. The flavours and presentation were gorgeous. Several of our guests required gluten and dairy free food so it was decided to make the trio of deserts all dairy and gluten free. They were absolutely delicious. Several guests asked for the recipes. I did not have to be bothered or involved in anything to do with the catering on the day. I was able to enjoy the reception along with all the guests. I definitely recommend Steve to everyone looking for a high standard of catering from an excellent chef who will make your event very special indeed. Thank you very much Steve for helping my husband and I to have a perfect wedding day. Oh my goodness I can barely move, my family and I have filled ourselves with the amazingly tasty and beautifully presented delights provided for a birthday party by Stephen James. Steve cooked for me and my work colleagues a 3 course dinner. Such a professional service, amazing food I have never tasted anything so good so many different flavours. I will without a doubt be using Steve again. Highly recommend him to everyone. We are a party of six who had the absolute pleasure of Steve cooking for us on Saturday night – What an amazing experience! Steve had been so good with his communications in the run up to the event, all the usual stresses of arranging a dinner party had been completely removed. My preparation consisted of nothing more than putting a few bottles of bubbly in the fridge. Steve turned up and is so friendly he just felt like one of us. The food was amazing – cooked to perfection and plenty to go round. The night was a roaring success and I do not believe I can give it full justice in this review. To be able to enjoy high end, restaurant quality food served with a smile in the comfort of your own home really is a unique experience -being able to share a glass of wine or two afterwards with the chef that made it for you makes it even more special. Thank you Steve for such a memorable evening. I am not sure where to start with how amazing this evening catered by Steve was! I booked a private dining evening as a surprise for my boyfriend whilst we stayed in a holiday cottage near Crewkerne. The correspondence with Steve to organise it was seamless and he was extremely helpful and quick to reply – even giving me recommendations on the wines we should have with our dinner. He arrived promptly so we could eat at 7pm, bringing everything (and I mean everything!) with him. We had the game terrine to start, duck for main and caramel panna cotta to finish – all of which were absolutely incredible and we cannot fault at all. My other half and I have agreed that it is one of the best meals, if not THE best meal we have ever eaten – cooked by a very professional chef in front of us. He even cleared up at the end so the place was spotless! The whole evening was perfect and exactly what I wanted it to be. I hope to organise future dining experiences with Steve James! I wanted to treat my nan to a early birthday treat so we hired Steve James to cook for us all. Nan enjoyed the evening. Steve done an absolutely fabulous job his food was amazing would highly recommend his services. Thank you very much Stephen. We had steve cater for my mum’s 50th birthday party Saturday afternoon. He came round a few hours before the party started and brought with him a whole variety of food. We gave him a few suggestions beforehand but most of it was his idea and everyone was impressed with what choices were there. He laid it all out with labels stating what each thing was and if it was suitable for vegetarians, he also prepared things like sandwiches at our house and everything else was also fresh. There were things there to meet everyones needs. The spread looked lovely and everyone complimented the food. There was also plenty there even though we’re all big eaters and we had some left over! Definitely good for money! He also supplied paper plates and wooden cutlery so we didn’t have to worry about a thing. Steve himself was really nice and friendly and professional. Would recommend to anyone and would use him again! We were more than delighted that Steve James helped us with the catering for a large family celebration at Lytes Cary, a National Trust property in Somerset which we hired for the week. Steve prepare 3 evening meals and a lunch, with three or four courses each, at various points during the week, with a “home cooking plus plus” approach served “family style” by Steve at the large dining table which seated all 14 of us (Some willing helpers from our various groups of family and friends helped with the serving up). From the outset Steve was extremely flexible and imaginative in helping design the menus (various intolerances, allergies and vegan requirements had to be taken into account for each meal) and helped us think through what standard of presentation and dish was appropriate. He helped create a friendly intimate family style we were aiming for, which was a challenge at such a large formal table. On the four days when he was with us Steve would arrive in good time, having prepared as much of the food as possible in advance, and he worked efficiently and calmly on his own to prepare the meals in the kitchen of the property where we stayed. The quality of the food quite simply was excellent throughout, with many imaginative dressings and ingredients and always beautifully presented. Quantities were never a problem either, Steve catered in a generous way on all occasions. Steve catered for a hen party we held on Saturday night. We had many different dietary requirements, and yet Steve worked it so that we all had the same canapés (they were incredible – full of flavour and visually stunning! ), only 2 different choices for main and the same dessert. This went down so well with our guests who usually have to miss out on such meals. Steve was fantastic to deal with the whole way through, professional, efficient & wonderfully clean and tidy! And above all the food was on point. Rob who was serving on the night was great fun and really helped to make our evening special. I cannot recommend Steve & Rob enough, they made our night such a success – thank you! We just had Steve come and cook for a family birthday in Somerset and it was a truly amazing experience . Steve did a selection of canapés all of which were great but my personal favourites were the squid ink flat breads topped with beetroot hummus and mackerel and the confit lamb neck spring rolls were to die for. The beef for our main was delicious , tender and flavoursome . We had two desserts -raspberry, vanilla and rosemary tart with rose water syrup & black sesame meringue Yuzu curd white chocolate and roasted apricots . They both looked so stunning we all agreed to have half each and were glad we did as both tasted divine. After the meal Steve and Rob cleared everything away and the kitchen looked like they had never even visited . This is the second time we have had Steve cook for us and I can’t wait for the next time ! I would like to thank Steve for an amazing meal on Thursday evening celebrating my parents birthday at Stawley Wood Farm House. Everyone was blown away by the food and the warm friendly and professional service we received. I can’t recommend him highly enough! Thank you once again. Such an amazing chef! Last weekend I organised a hen do for my best friend in Weymouth. We asked Steve to cook for all 13 of us a three coursed meal. From the beginning it felt like being in a private hotel. The food preparation was flawless, the food was exceptional both the taste and presentation. It really was fine dining at your house with such a personal touch too. Also a little gift for the hen herself! When Steve left and we returned to the kitchen you would never of known he had been. It was cleaner than before he has started! A perfect combination of fine dining in the comfort of your own home! My only regret is we didn’t opt for the five courses! I have known Steve James for quite a while now from when he started with us as a student at the cookery school. Over the years he has really impressed all of us at the school with his professionalism, passion for food and of course his cookery skills.On one memorable evening spent tasting his dishes,… I had the pleasure of tasting the best panna cotta that I have ever eaten. It was served with a chilled compote in a glass teapot and it blew me away. Stephen James is a very talented chef with an eye for great detail. His menus are both stylish and modern and are truly delicious. normally choose off the menu but this was cooked to perfection and full of flavour. I would definitely choose it again. Can’t wait for the next time Steve thank you so much. Steve was absolutely fantastic throughout the whole time dealing with him. He was extremely responsive to messages initially to understand our requirements and was also very forthcoming with offering options for a bespoke menu. Based on this professionalism I was hopeful of a good meal, but I could not have expected just how fantastic it was. All eleven of our group were raving about the quality of the dishes and still are 3 weeks later. I thoroughly recommend Steve, his professionalism, service and food are exceptional. We had Steve cater for our party of 12 on New Year’s Eve 2016. With a former newspaper food critic and two committed foodies this was going to be a tough audience. From the start Steve and his able assistant got us onside. A soufflé to die for and a flavour packed meat terrine, followed by a pork belly or homemade pie, then a delicious cheesecake or dreamy chocolate fondant to round the meal off. Everybody was raving about the food for the rest of the evening. Book Steve now before he get’s his first Michelin star!! I was a dinner party guest where Steve was doing the cooking. All 3 courses, canapés and bread were absolutely fantastic. Restaurant quality food in your own home and one of the best meals I’ve ever eaten. I would highly recommend. Steve came to our house at the weekend to cook a three course meal for myself, my husband and 2 friends and I can hand on heart say it was one of the best meals I have EVER had. It was fine dining quality without the hassle of having to get ready to go out and even more of a luxury no one having to drive especially with the gorgeous cocktails that were produced to go alongside each course. The food was all excellent and beautifully presented but with my sweet tooth I can’t recommend the panna cotta that we had enough… I would order that time and time again, it was stunning. The one thing we were both nervous about was having somebody else cook in our kitchen and then the clearing up afterwards but Steve respected the kitchen and left it just as he found it… A night off washing up in our home, a rare luxury! If you want a night in with the same quality food as you would expect from a top quality restaurant we would definitely recommend that you book Steve, you won’t regret it. We look forward to booking you again soon, thank you so much. Quite literally… Hand on Heart… Just had one of the best meals we have ever had. Ever. Impeccable. Delicious. Amazing. Thank you so much! Steve’s food is incredible! Absolutely stunning presentation from canapés through to dessert and amazing tasting food. The gin cured salmon was to die for and the tenderest beef that cut like butter. It was finished with a perfectly scrumptious chocolate parfait. He is amazing and a genius with flavours! I’d highly recommend him to anyone. Steve made a dinner party for us and we were impressed from start to finish. Steve listened to our ideas and transformed them to restaurant standard dishes. They included a creative edge with flavour combinations that surpassed my expectations. He himself was friendly and very easy to work with. He made sure myself and our guests had an evening we intended and without any of the stress! Thank you again Steve! We shall be in touch for our next party. We booked Steve James for a surprise 40th birthday dinner party, as we wanted something a little different and of course, extra special. Having not used a home chef before, we were not disappointed as the food was tasty, imaginative, along with a few hidden gems and prepared by a highly accomplished chef with an eye for the finer details. The standout dishes for our party we’re the pork (cooked three ways) and the strawberry bomb dessert (I can still taste this now! ), these we’re truly delicious and amazingly presented too. A great evening was had by all and we will definitely be requiring Steve’s services in the future for another memorable evening. I have recently used Steve James’ private dining services to cater for me, my partner and two friends. We all immensely enjoyed our evening where Steve prepared and served us 3 courses of amazingly tasty food which was presented as if we were in a high quality fine dining restaurant and all in the comfort of our own home. We have often been out for meals but have never been catered for in this unique, personal way and will definitely be planning an evening like this again. The presentation of food was beautiful, Steve was so friendly and left my kitchen as if nothing had happened in there!! As we could supply our own drinks and there was no need for taxis this ended up being a special yet affordable evening and the ease of booking and communication with Steve beforehand was fantastic. I would thoroughly recommend Steve and can’t wait for the next time! We booked a food and wine tasting experience and we were not disappointed. A superb experience and a great informative wine experience. A must for anyone interested in locally produced wine. Our host and chef could not have been more welcoming and we would definitely go back for a Summer tour.